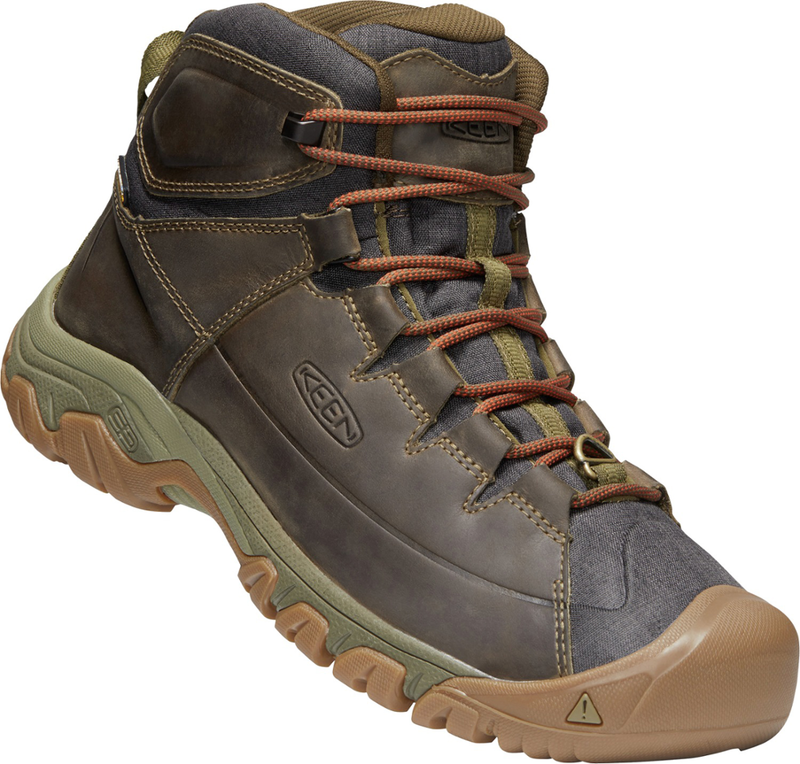 A well-constructed boot that is comfortable with a little break in, and supportive with good traction. The waterproof claim seems good for normal recreational, use but in constant water or snow, dampness seeps in. 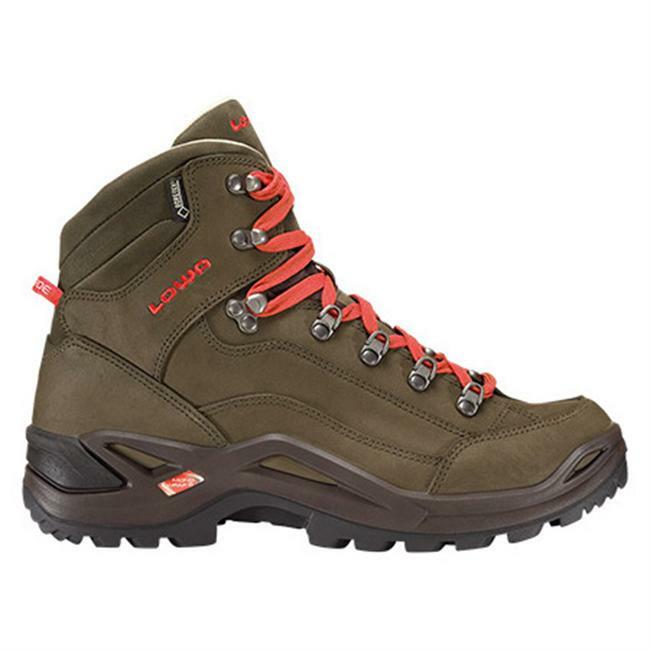 Overall a good boot at a better price point than many similar sturdy boots. 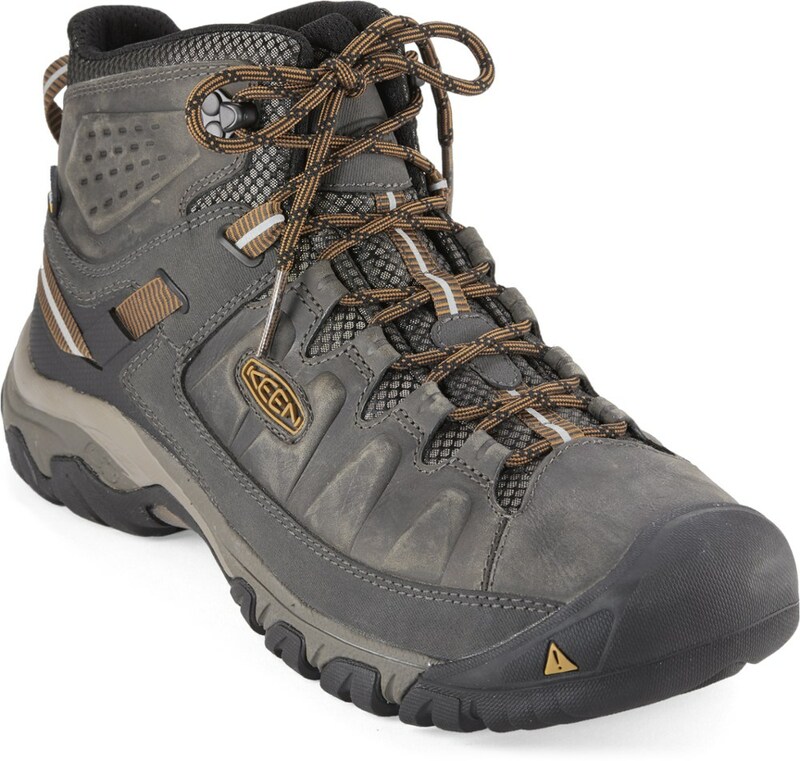 This new model of the popular Keen Targhee is comprised of waterproof leather and textile upper, Keen Dry waterproof membrane/mesh lining, an ESS stability shank, dual-density compression molded EVA midsole, and non-marking rubber outsole. 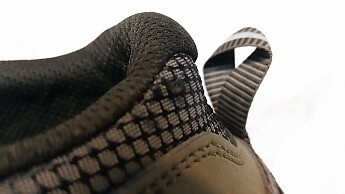 This creates a very common patchwork of stitching across the boot. The stitching seems solid with no obvious flaws. I should note that the description of the boot above is summarized from Keen’s website, and as far as leather goes, there isn’t really that much that I can see—it is mostly textile. Maybe leather looks different than it used to? 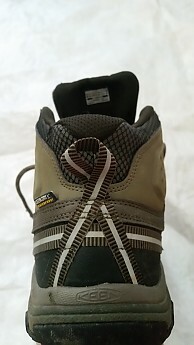 Lacing is secured through several loops integral to the upper that seem much sturdier than my current Merrell Moab boots which have fabric “tabs.” The last two lacing loops are a webbing strap (see below) and a sturdy plastic quick lace at the top. 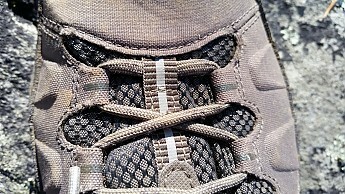 One complaint on the lacing—with only one level of quick lace there are limited options for alternative lacing techniques, or it at least makes it more difficult to lace up the top before threading back through a lower loop. cold, as well as sunny and warm. Terrain included mud, streams, rocks, sand, gravel, and everything else including asphalt and concrete. I have a relatively normal to slightly thin heel with long toes but a relatively wide midfoot. I also have had multiple broken toes and sprained ankles in my feet from playing soccer (or football to most countries) for several decades when I was younger. This leads to a couple of boot-fitting issues for me. I like a boot with some ankle support, as it really does make a difference for me especially on my weak side. The wide foot with long toes counteracts the fit requirements of a thin heel. My perfect fit is a thinner heel with a wide toe box—but not too wide. After raising two boys, I call my toes “toenagers”—give them too much room and they run wild, but constrain them too much and there is a lot of friction! 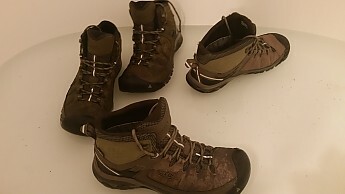 I requested size 11.5, which is typical for me, although in some brands (Merrell) I order a wide version. 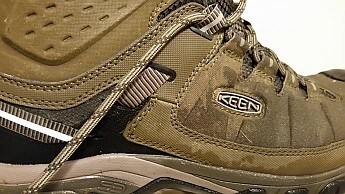 Keen’s wide toe box was just right for me. 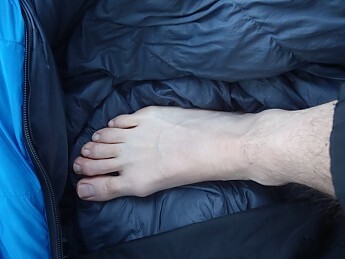 My “toenagers” were fine and responded well with the occasional hot spot in my usual places (due to toe overlap not boot dependent) easily treated with typical supplies (i.e. Leukotape). The heel seemed to fit well—minimal slippage even for my thin heel, but again this is going to be a personal fit so try before you buy. I was a little disappointed that the apparent webbing strap that looks like it could tighten up the heel didn’t seem to have any effect. Maybe it’s just a cosmetic thing or to help stability? To have even an imagined difference in the heel width I had to tighten it so much it hurt the top of my foot. I would be happy without this extra, which also introduces more areas for wear and dirt (although I experienced neither). Lacing was typical—not bad but not outstanding. It must be double knotted if you are going through some brush etc or you end up like the photo above, which was on a work site after a scramble through five-year cutover and blackberry. 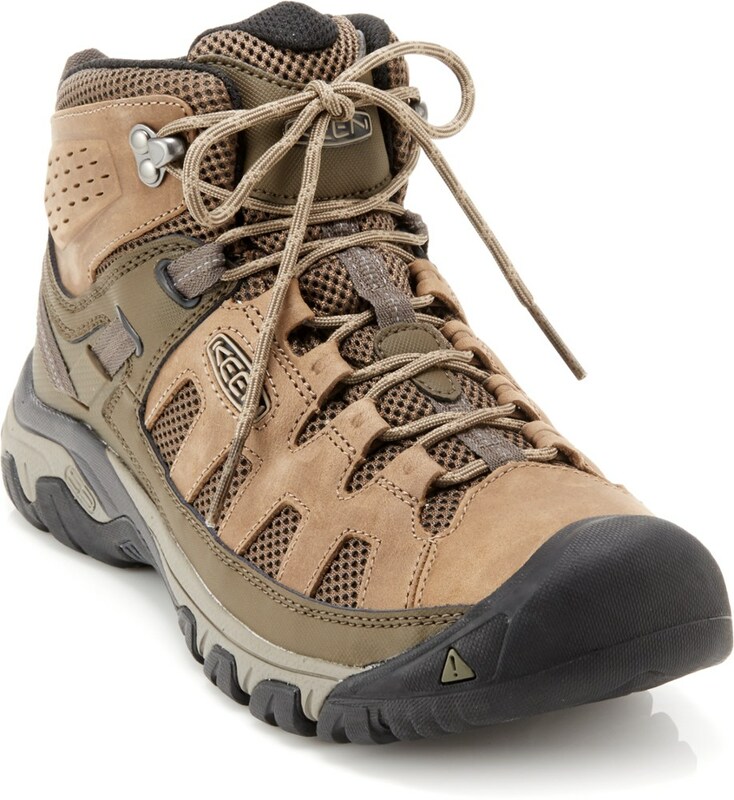 The Targhee Exp Mid has minimal ankle padding—it’s more like a traditional leather boot. 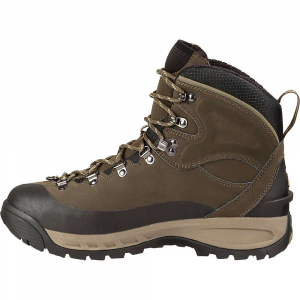 I actually prefer this in sturdier boots as the padded areas seem to wear a lot faster than the outer leather. 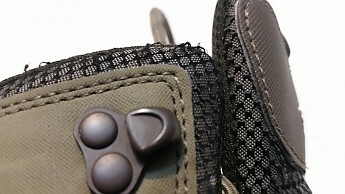 This lack of padding didn’t cause me an issue, but for those that need it for their personal foot shape, be aware. I did have some initial pain in the top of my feet—possibly due to limited padding on the tongue. This improved after a break-in period, but I had to be careful with the lacing tightness to get it right. Without a ton of tongue padding, there is a smaller window of nailing the fit down. I got it dialed in with some practice and the issue went away. Note that I have rather bony feet and that this is not an occurrence limited to this boot. 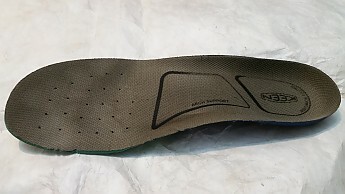 As usual, I found the insoles lacking for my feet, which are used to Superfeet insoles and now two higher priced ones (Abeo). 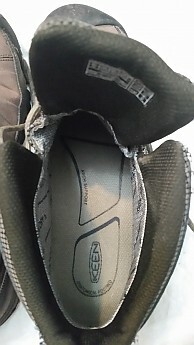 However, I would rate the Keen insoles, at minimum, above average for stock boot insoles, and a definite improvement over the ubiquitous Merrell Moab boot insoles, which I find lacking (see this review). Note—I stuck with the provided insoles for the entire test period as that is part of the boot being reviewed. 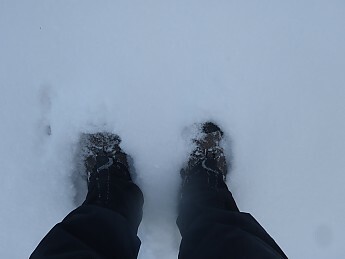 Although the Targhees seemed thin they were surprisingly warm even walking in snow. I am not suggesting them for winter boots, but they beat my expectations for shoulder seasons (say above 10 degrees F). I am a notorious heat generator though and can thaw out a pair of iced boots in a few minutes. They are comfortable enough for me to drive with and in fact that is one of my criteria for boots—if I don’t like wearing them driving or around the office I don’t buy them. The Targhee Exp Mids have good tread. 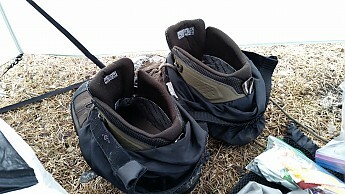 These are not the traditional clodhoppers with giant lugs for extra traction that can tear up a trail. 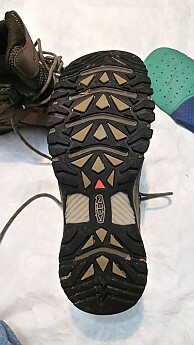 Rather, they are perfect for what I prefer—you can feel the trail (or off-trail terrain), but still get support for the constant pounding of backpacking (although the pounding is less with a lighter pack now). I never felt my feet were getting beat up even on the rockiest scrambles. 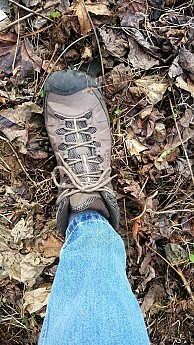 Asphalt and concrete did wear on me a bit, but that is no different with any other boot I have tried that is designed for the trail not the road. Ramping up the insoles would probably have addressed this well. There was no more slippage than usual minor ones in numerous climbs up rocky trails in snow, ice, and rain even to that touch and go point where you probably should have thought about bringing extra traction for winter conditions. I never fell or completely lost traction except on a pure sheet of ice hidden under a thin fresh snowfall. The key area of weakness is the middle of the sole, where there is less traction. If that portion ended up accidentally on a wet root or peak of a rock, I had to be more careful. 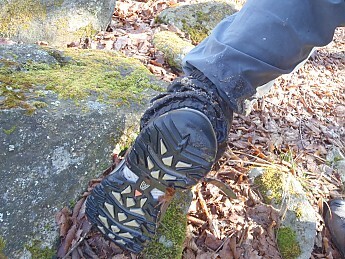 This is a common weak spot in many boots for traction, but there is some grip (lighter parts of the tread above). 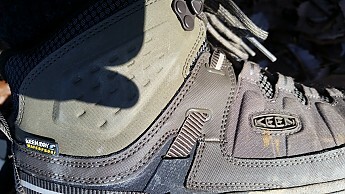 The photo shows the Targhee EXP next to a Merrell Moab Ventilator. You can see that arch tread is a little more curved in the Moab so may not hit the roots/rocks at the same place, but also does not have the ribbing that the Keen does (lighter area). Overall it was difficult to tell a difference between the two in traction performance. and some very minor (typical) abrasion around the lace loops. There seems to be no loss of function or comfort with these areas. 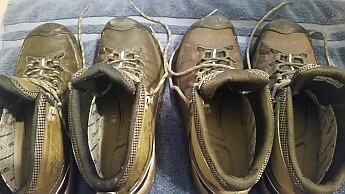 The outsoles show little wear after what I guess to be between 300 and 400 miles of use on varying terrain. 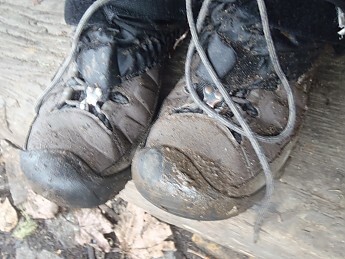 The toe guard is well constructed and held up to my abuse walking through disturbed sites for work including thick briers and logged sites (the photo above is after traipsing through brush and blackberry patches on a site visit). 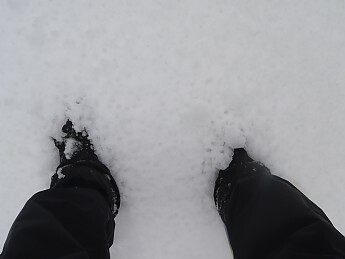 However, the waterproofness of these boots did not meet my expectations. When a manufacturer claims something is “waterproof”, I take that literally. I expect it to stay dry more than just in a rainstorm or on a wet and muddy trail. 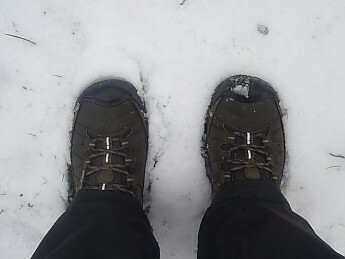 The Keen Targhee initially seemed to be waterproof during walks in rainy weather and light snow. and trips through 4- to 24-inch snow cover. Once the Targhees soaked through during extended exposure to water or snow, they became moist inside—primarily along the tongue but that was difficult to tell. 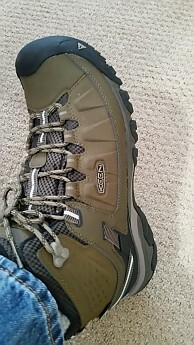 I asked (via Trailspace) for waterproofing suggestions from Keen, who graciously provided a second pair of boots (the first were 2017 pre-production models). 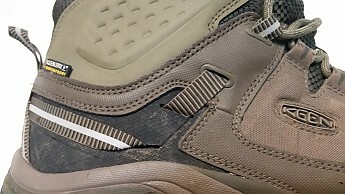 This pair was the same design, but a slightly different color (2018 pair on the left). 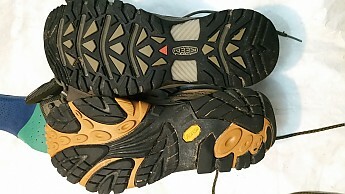 The second pair performed the same way—initially waterproof during “normal” exposure followed by moisture getting in after the tongue and uppers were saturated. First off, I really enjoyed sailing these around the bathtub so the experiment took a little longer than planned—should have invested in some rubber ducks or boats as well to make the photos more entertaining! More importantly, I kept each boot submersed up to the lower lacing for two minutes, then removed them, felt inside for dampness, and filled them with newspaper to soak up any moisture I couldn’t detect. However, I felt no dampness immediately after the inundation, and after 30 minutes I found no moisture on the newspaper either. 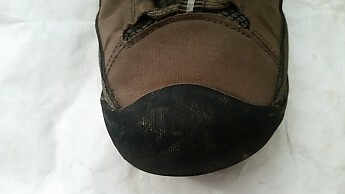 This convinced me that there are no inherent flaws in the manufacturing of the boots—like poor stitching or other seals being bad—but rather that over prolonged exposure (probably measured in hour units rather than minutes) the tongue and other fabric areas become saturated and allow water to soak through. 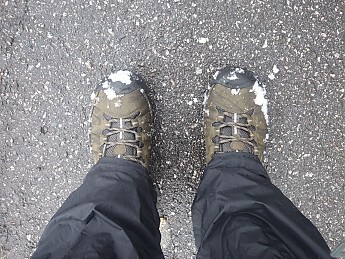 After a day of hiking in low snow (below the top of the boot) with gaiters to keep moisture out, the Targhees were wet on the inside. 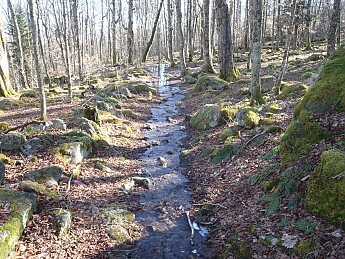 They froze up on the 20-degree night and took about 30 minutes to thaw out in the morning along the trail. 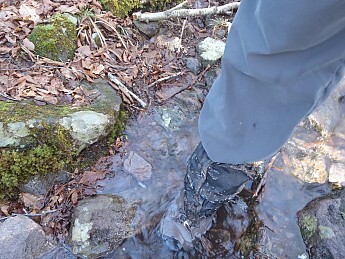 As mentioned above, the Targhees did keep my feet dry on literally hundreds of shallow stream crossings and typical recreational and work conditions, so I would dub them “water resistant” and probably waterproof enough for recreational users who avoid trips in really nasty prolonged weather. But again, if you say “proof” to me it’s a higher standard. These are low maintenance boots as there really isn’t much leather to treat. 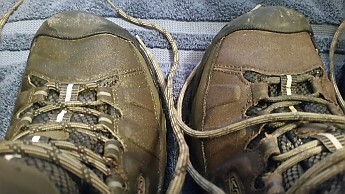 I wiped the Targhees down or sprayed them after each trip and threw them on my boot drier. So far after extensive soakings I have not detected any odor...that may change with hotter weather usage and more sweat than precipitation. Keen suggests gently brushing with a soft bristle brush or hand towel to remove loose dirt and debris. Some mud stains did take a little brush work to come out (the stains in the photo above are during a trip, not after brushing). Keen suggests lightly rubbing a gum eraser and light brushing for stains, but I really don’t care if my boots are stained as long as they are functional. Tough stains are recommended to be treated with a mixture of water and vinegar on a damp cloth, but may cause slight discoloration to the area. I really debated if I should include this section. If you are choosing boots that match the interior of your SUV that doesn’t have mud on the tires then you are probably on the wrong website! That said, these boots look good in my opinion and I never worried about wearing them to semi-casual meetings (if I can wear jeans instead of fancy pants to a meeting I consider it semi-casual). One coworker remarked that the reflective webbing stood out a bit. Anyway, I don’t really care that much about this category…beauty is in the eye of the beholder so look at the photos and decide for yourself. 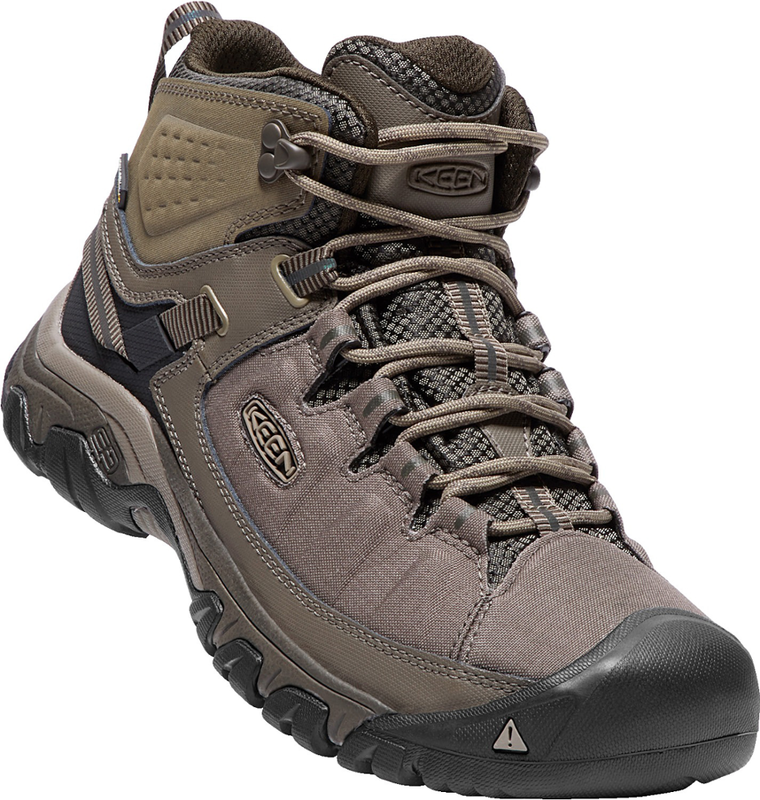 This is a good, relatively comfortable (for me), well-constructed boot that I wanted to award a higher rating. 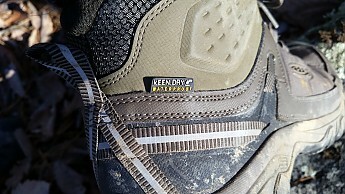 However, I could not look past the lack of waterproofing during extended exposure for a boot labeled “WP” in the name with a KeenDry tag on the boot. 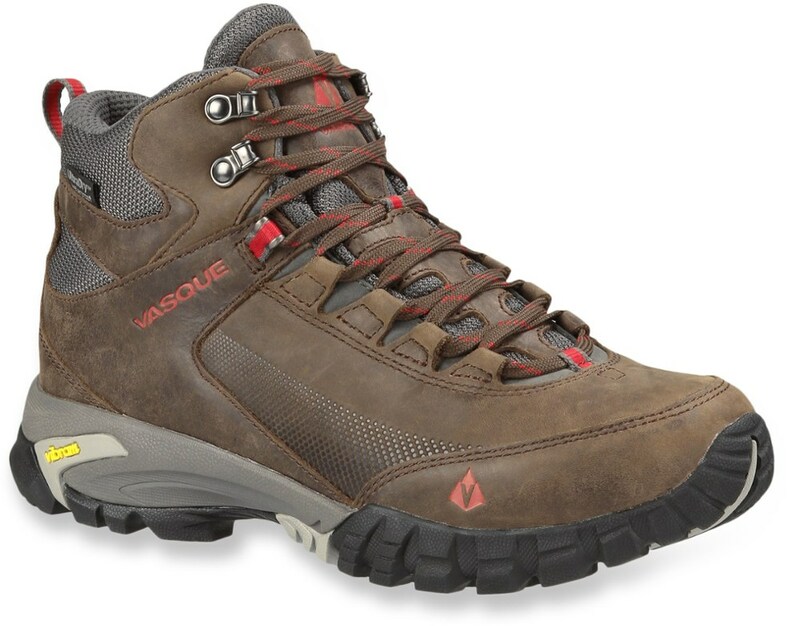 I would still recommend the Targhee EXP Mid WP to someone who wants a mostly waterproof boot over a full leather, which is usually much heavier. The price point in the low $100s is reasonable and competes with some other options. 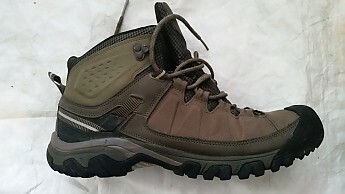 I will continue to wear them (if allowed to retain a pair after testing) for work and in wetter winter day hiking conditions over my Merrell Moab Ventilators that I go with during three seasons. They will not be my winter boot or extended wet weather footwear. 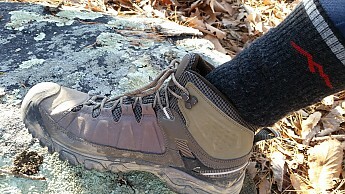 Thanks to Keen and Trailspace for the opportunity to test the new Targhee Exp Mid WP boots. I just took my pair off. I find them hard to keep tied no matter what I do. 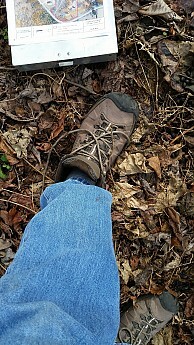 They're comfortable enough and I like them best around town but have worn them on the property working and in the woods hiking. They're lighter than boots and they work, but I doubt I'd buy another pair. All that said, Phil's review is as thorough as one will ever read and should give you all the info you need to decide. Great review, Phil! It was funny and informative. I laughed at your "toenagers" comment. 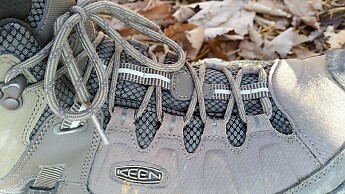 Thanks for testing these Keens out so thoroughly and sharing your results. Must've missed this when you published it, but I remember reading the draft. One of the better boot reviews I've ever seen. Congrats man, you can tell a lot of work went into this! I really like these boots. I agree totally that they are only water resistant. 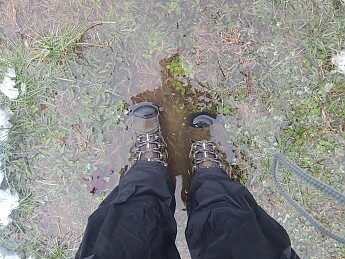 If it pours all day (even with gaiters) the boots will start to take water. 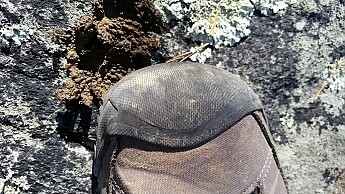 You will also feel hard sharp rocks under your feet when you have a heavy load. Great grip and super comfy. Could walk for weeks with these. Very durable and warm and cozy. They do get hot in the summer. Cheers. Welcome to Trailspace, Hiker mates. I agree...good boots overall. Mine are still holding up well to abuse for work several days a week. Still not waterproof though...wosh they hadn't raised expectations with that in the name.